Dakota is a super friendly and wiggly 7-month-old pup. 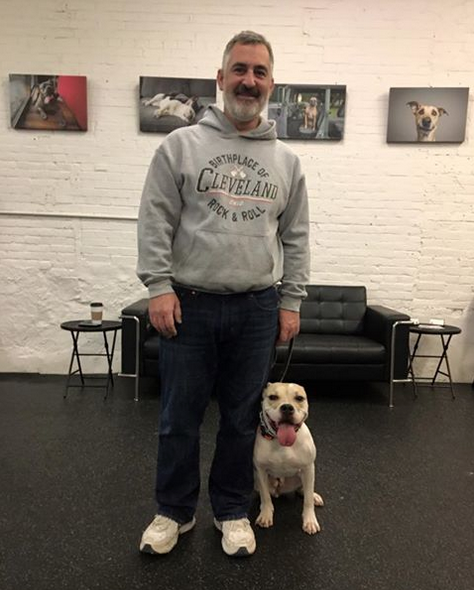 Gary brought Dakota in to set the strong foundation for obedience and behavior. There were smiles all around as they finished up their training program. "There very few people who are passionate, disciplined, and incredibly talented at what they do. Scott is one of those few people. He gave us the tools to be successful with our dog and to provide her/us with a happy environment." –Gabriel A. "We LOVE Scott as do our pack of canines! What can I say- not only does Scott know his stuff, he is willing to listen to what your particular issues and desires are and tailor your training sessions to meet your needs. 100% efficient. Thank you Scott!" –Shepherd W.
"Scott has done such a great job with my boxer. She was very aggressive toward my other dogs and her toys. I was at my wits end with her and thought I may have to have her put down. Now she is a joy to be with and the other dogs are no longer afraid of her. I needed as much training as my dog, so thanks for our training Scott! I am very grateful for everything you have done for us." –Debbie B. "We cannot ever truly express how wonderful our experience was with Scott at Evolution Canine. We did the five weekly training sessions and could not be happier with the results. Lucy, our four year old German Shorthaired Pointer, was a neurotic and anxious mess. After our time with Scott, she has done a complete 180 and is now obedient, relaxed, and calm." –Beth R.
"I work at the Cleveland APL and was given Scott's name by a co-worker. I found Scott to be very professional. He has a very nice and clean facility and treats the animals firmly but kindly. I was initially worried about the correction collar and then Scott put our minds at ease by showing us how it is used as a correction and not as a punishment. Scott not only trained Loki but also trained us. Loki came back happy and obedient and two months later he is still doing well with his training. We would highly recommend Scott to anybody who is looking for a well trained dog." –Lisa K.
"Winston is so much better since visiting Evolution Canine! He was full of anxiety and dominance before training but Scott showed Winston the tools to be a great dog. Scott took our dog's personality into account during his time there and didn't treat him the same way he would treat every other dog. We did our homework when it came time to find a good trainer for Winston, and Scott was hands down the best trainer for our dog. We have highly recommended Scott to anyone who will listen!" –John K.
"Sammy, our crazy Sheltie, went to the training course to correct behaviors such as car chasing, bike chasing, people chasing and other lease walking challenges. Now Sammy is a joy to walk. He heels well, he is polite with neighbors, and when other dogs are barking and jumping he just sits there and looks at them like they're the crazy ones. Thanks Scot for a great job." –Frank W.
"After a 5 session lesson with Scott, I am a huge fan of his. He gave me the tools and confidence to set Brutus up for success. I am truly grateful and happy that we chose Scott. I have a calmer and more obedient dog because of him. " –Joy K.
"Can't say enough good things about Scott's training. When we got Cooper as a stray, we brought him home to our downtown condo. He was nipping people in the elevator and on the streets, stealing things off the table and counter, and didn't do too well with other dogs. I was afraid I would resent adopting him, so we began training with Scott. Cooper became a completely different dog. He is obedient and friendly now with both people and dogs and I can take him for a walk without worry. I have also been stopped on almost every single walk I go on and have been asked if I was a trainer. I always tell them no, but I had a great trainer through Evolution Canine! Thank you Scott for helping to keep Cooper (and company) happy!" –Regi S.
"Scott did a fantastic job establishing the pack order with our puppy, Sully. Like many "puppy moms" tend to do, I babied Sully for too long in the beginning; he had no respect for me, was beginning to show signs of aggression towards me, and only listened to my husband. Sully is a completely different dog now, he is obedient, respectful, not only towards me but to everyone, and listens very well. He is also much calmer and has truly benefited in more ways that I can say from Scott's training. If it weren't for Scott I'm not sure we would have been able to keep Sully in our house. THANK YOU!!" –Jenny E.